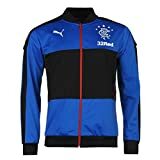 From the streets to the stand, this men’s Rangers FC Stadium Jacket from Puma will ensure your Gers pride is shining through. In the traditional royal blue colourway, this jacket features a full zip up to the chin plus ribbed cuffs to provide a comfortable fit. The iconic club crest shows to the chest, so when you’re roaring on Joey Barton and co at Ibrox your club pride will be on full show. This entry was posted in Soccer and tagged 201617, Jacket, Puma, Rangers, Stadium by FPSports. Bookmark the permalink.